That so cute, you think you’re scary. Well, mister, I’ve seen scary and you don’t have his smile. Suiting up as Harley Quinn means that you are going to have to become an all-around bad girl. One minute you might be snuggling up with your main squeeze The Joker, and the next you might be battling off a rival gang's henchmen. 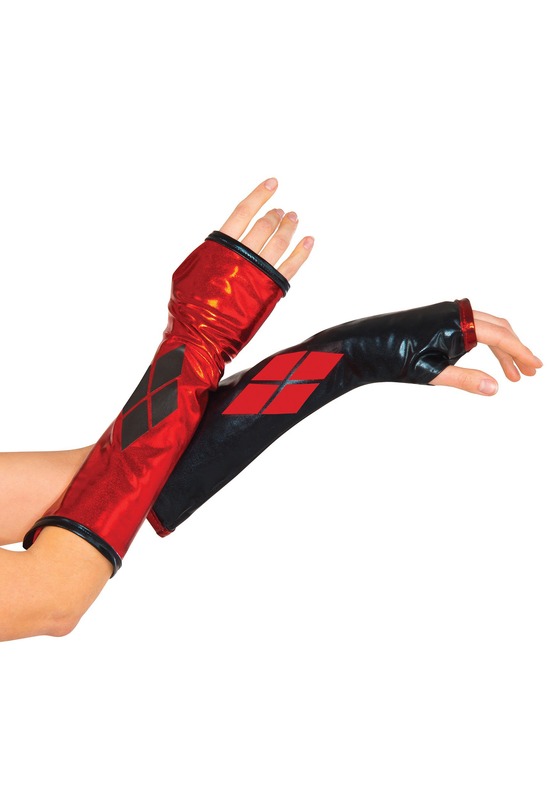 Outfit your Harley costume with these signature gauntlets. They'll add a fantastic touch to your Gotham look, and they'll also add a little padding for when you have to drop a sucka with a Judo chop! Paired with any of our gorgeous Harley Quinn outfits no matter what era you're aiming for, these gloves are sure to be the perfect touch. They cover most of your arm as you swing that ridiculously oversized hammer and add a little shine to your ensemble. There's nothing like a pair of gauntlets to show the world that you're not a girl they can mess with.